Gearbox Automatic review | What Hi-Fi? A clear plinth gives it a unique look, but it's ultimately uncompetitive at this level. Despite its name, this Gearbox Automatic won’t be of any use from the driver’s seat. Rather than some kind of automobile transmission, it is the debut turntable from Gearbox, a London-based, analogue- and digital-friendly record label. It’s also the first venture into consumer hardware from a company that, in its own words, ‘specialises in reel-to-reel and cassette tape mastering for vinyl cuts and digital masters’. So how does an industry newcomer turn heads in a crowded market? For starters, you might ask a renowned turntable specialist, such as Pro-Ject, to build it for you. You could also give it some unique functionality and a distinctive, quirky look. If this was an official checklist, Gearbox would be confidently putting ticks in all three boxes. The Gearbox Automatic comes into a world as a unique proposition. It combines the old and new, bridging the gap between analogue and digital with two features. Firstly there’s the pragmatic and useful integration of a Bluetooth transmitter for streaming the vinyl being played to wireless headphones and speakers. While you might expect the second to be a USB output that allows users to digitise their record collections, instead the Automatic brings a new trick to the table. Thanks to built-in wi-fi and Gearbox proprietary track recognition software, the Automatic recognises what music the turntable is spinning and, via the Gearbox Automatic iOS or Android app, allows you to open individual songs in Spotify. The idea is that it’s a quicker way to add songs if you want to organise your record collection into playlists, for example. There is a tracklist history stored in the app, from which you can open each song in Spotify at the press of a button. It works well, but we can’t say we’re completely sold on the tool’s usefulness or universal appeal. The aesthetic has a bigger pull. The Automatic’s completely transparent rectangular plinth means you can spy on its internal workings, including the glowing valve-based phono stage. The platter’s footprint is no larger than that of a table mat, so when a 12-inch vinyl record is placed onto the spindle it overhangs the Gearbox’s edges, making it look rather like a small helicopter. The plastic plinth wouldn’t look out of place in an Early Learning Centre store, with the Automatic looking and feeling at odds with its hefty price tag. It’s available for £499 upfront at Richer Sounds, but buy directly from Gearbox and you can choose to pay 12 monthly installments of £50 (£600) or 24 monthly payments of £30 (£720) respectively. When not paired to a Bluetooth device, the receiver’s light flashes continuously, which is a little distracting if the turntable is placed in front of you. We’re more content as we set eyes upon the Pro-Ject aluminium tonearm (with sapphire bearings) and Ortofon OM10 moving magnet cartridge. The benefit of a built-in phono stage means it can plug straight into the line-level input of an amplifier via the supplied RCA cable. Set-up is easy. Once the deck is in position, you simply need to place the platter in the bearing, attach the belt, and lower the stylus onto your vinyl once its guard has been removed. Both cartridge and counter-weight are already fixed in place (the tracking force measures a sensible 1.75g) so there's no need for adjustments. 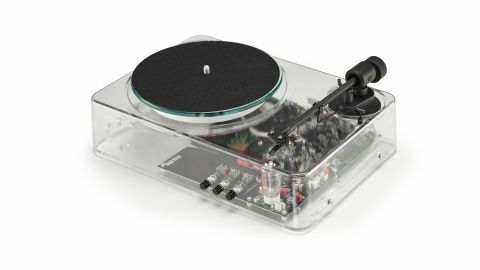 This deck is about as plug ‘n’ play as they come, although it isn’t fully automatic in as much as it doesn’t move the stylus into position for you with the press of a button. We have some reservations about the design, but unfortunately the Automatic’s performance really disappoints. Its clarity and even tonal balance make for a listenable presentation, but the level of insight and dynamic attention is below our expectations of a turntable of this price. That’s after giving it significant leeway for its unusual design and feature count. We’re left wanting more as we exhaust Nick Cave’s The Boatman’s Call and Four Tet’s There Is Love In You, the Automatic failing to unearth subtlety in piano strokes or grasp a sense of cohesion with trippy rhythms. Despite its name, the Automatic never really shifts into gear. It fails to deliver an energetic performance, and the fact it’s prone to the odd warble as a result of speed instability doesn’t help either – once you know it’s there, it’s hard not to hear it. When streaming records to the Award-winning Audio Pro Addon C10 wireless speaker via Bluetooth, the sound is muddied and unclear enough to want to turn it off completely. With rivals such as the superb Pro-Ject Juke Box E (£369), Sony PS-HX500 (£249) and Audio Technica AT-LP5 (£250) available for much less, this is always going to be a hard market to make an impression. But the Gearbox Automatic doesn’t do anything to find favour past its initial impression as an intriguing competitor. Ultimately, it’s too expensive for what it is and we’d advise you to steer clear.